Be, of 2BeUva.Etsy.com, sent this journal for our travel-themed book swap. 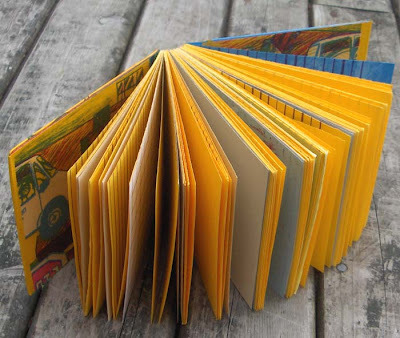 The covers are Be's original artwrok that she printed on a Chief 17 offset press using three plates from her drawings, drawing each layer of colour by hand. These images depict Car-Person, a cartoon character that she made into a movie, exploring the feeling one gets when one drives for a while and becomes "one" with the car (watch Car-Person on Be's blog). 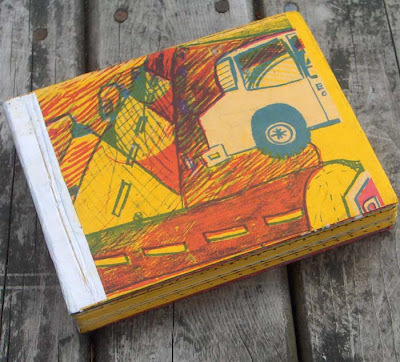 This is a hardcover journal and the pages are upcycled/recycled papers salvaged from her bindery and print shop jobs; about half the pages have hand-drawn lines, and the rest are blank. Visit 2BeUva.Etsy.com to see more.